This is what I woke up at Om Koi. Can you say retirement home? 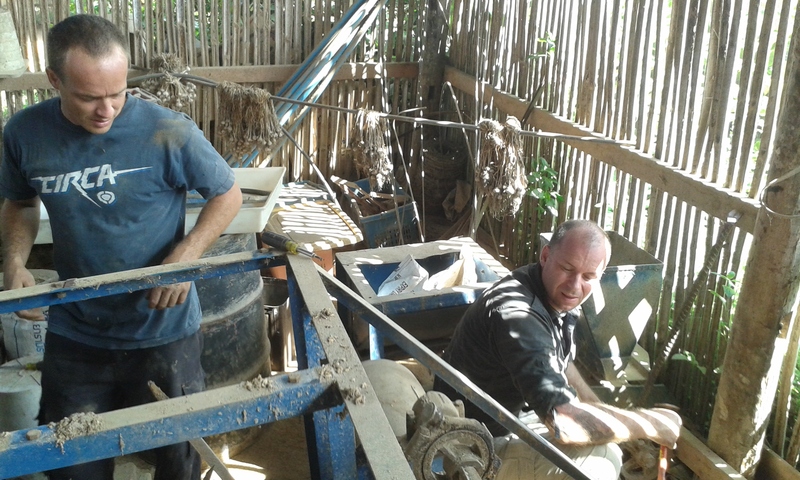 One of our good friends, Sean, has had an unused rice mill sitting up in Om Koi in northern Thailand. He generously decided to donate it to our children’s home. We left last Sunday and arrived in Om Koi that night, meeting Sean along the way. He has a house in the same village where the rice mill is, which is amazing! He built it himself and has plans to enlarge it. The weather in the village was very cool with clouds all around in the morning, and the panoramic views were breathtaking. The highlight of going to the village was meeting Sean’s 87 year old grandmother-in-law who is still a very productive part of the village. In fact, most of the people we would consider elderly still climb trees, cut wood and manage basic farm tasks. It causes me to question the expectations we place on the later years of our lives. Sean taking apart the mill, Aaron demolishing the concrete. After a night of talking and catching up on old times, we got up the next morning and went to work disassembling the rice mill. The base had literally been cemented into place. This was by far the hardest part of taking down the mill. We all took turns chipping away at the concrete in between removing the nuts and bolts of the mill itself. After about four hours of non-stop work, the mill was apart, the base free of the concrete, and everything loaded into the back our two trucks. It was time to move on to Chiang Mai. We got to Chiang Mai that evening. In morning, I got the next round stamps from immigration for our Visas and we were on the road shortly after lunch. We arrived at the children’s home just before dusk and had just enough time to unload and cover the mill pieces before rain started coming down. We were greeted by the staff there to a full dinner and tea. I got to know the staff there a little better and practiced what little Thai I know at this point. It was definitely the most Thai I’d spoken since being here. 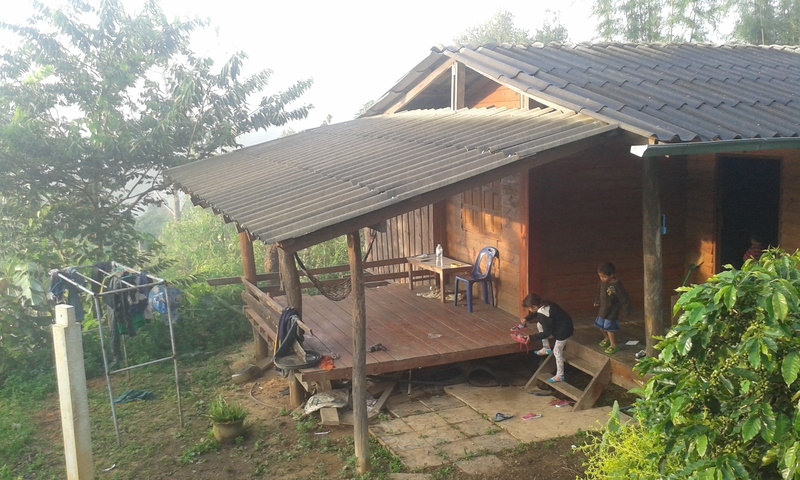 The chidren’s home’s backyard. I don’t think I’d get tired of that view. After a great night’s sleep, we set to work laying the cement footers for the rice mill. After digging out the holes and framing some molds above the ground, the cement was poured. These would have to harden before moving on, so we drove down to Maesot, which is only an hour away, to see our families. Everyone at work. It took about ten people to get all together in the end. It really does take a village! We came back the next day to put the mill together. It was definitely a group effort as Sean, Aaron and I put the bulk of the mill together with help from our older sons. Meanwhile, the staff worked on the conveyor belts that needed to be replaced. The process went better than expected because of the glitches along the way. These were all opportunities for the staff to learn better how the machine worked as well giving them opportunity to troubleshoot problems as they arose. By the end of the day, the machine had been fine-tuned, tension properly achieved, and rice was being milled. Success! 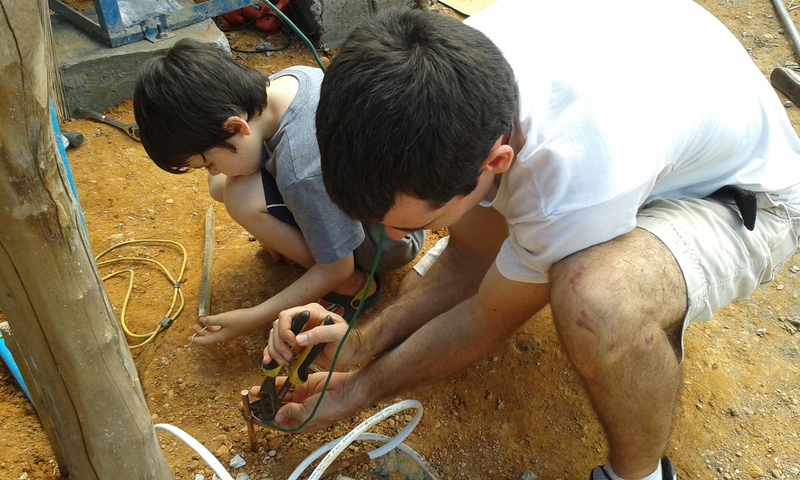 My son and I connecting to the grounding rod. Safety first. 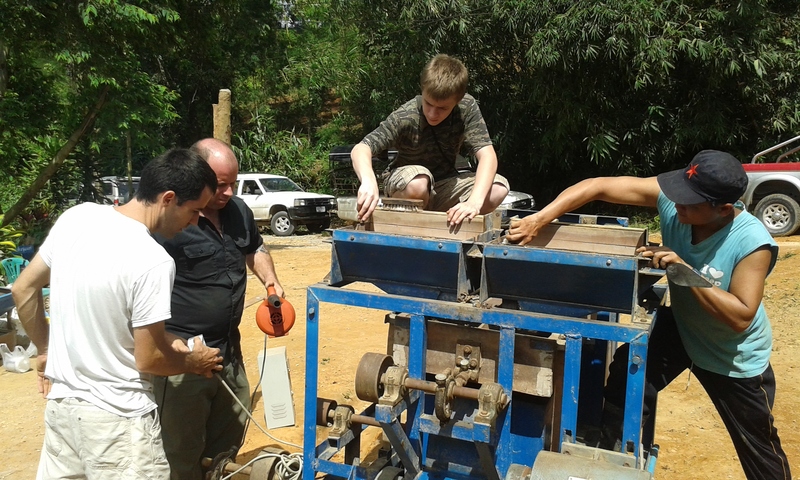 We hope that this mill will be the start of a new business for the the children’s home. There are only a few rice mills on the mountain to service the many rice farmers who live there. But even if the business doesn’t take off, at the very least, they will be able to mill their own rice without having to pay. 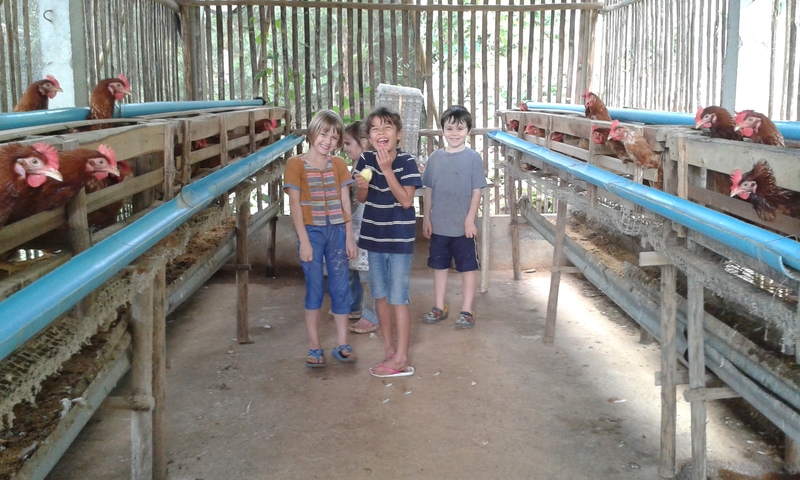 The kids taking a tour of the chicken farm. These make the best eggs on the mountain according to the locals. At the end of five days it took to do all this, I was exhausted. I’d been feeling homesick for both America and my family. There were a lot of emotional hills and valleys I traveled upon. But in the end, what I walked away with was an overwhelming sense that I do not deserve to do the work that I get to do. 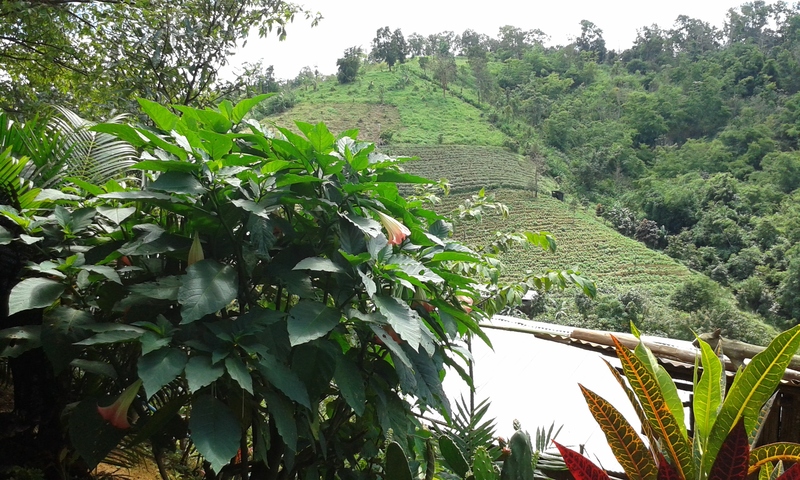 It was such an honor to stay at Ban Sang Suang, let alone get to help provide them with a rice mill. The work they do there in helping to provide a safe place to stay for children of families in transition is simply amazing and nothing short of miraculous. I look forward to all the future projects I can be a part of with them. They stand as a huge beacon of hope proving that Life is Good. For more information about the ministry of The Charis Project, please follow this link. If you would like to support my family as we partner with Charis, please click Donate. Feel free to leave a comment, and click the follow link to the right to receive regular updates. Thanks for reading, and all the best to you in your own Good Life. Previous Post Greenhouses, Seeds and Maggots, Fun!